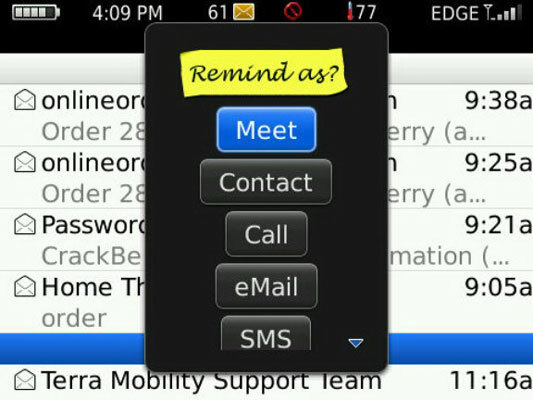 Keeping track of all your appointments, tasks, meetings, and shopping lists just got much easier with the BlackBerry. These apps provide calendars and calendar entries that you can use to stay on top of what you have to do today (and remember what day it actually is). Prod you to action at a particular time when you come across a message that you want to respond to by mail or phone. Remind you about a missed phone call, choosing the best time for a response. Send you a wake-up message when you have a task to do, such as a calendar appointment, a job you need to do at a particular time, an app that needs to be run. 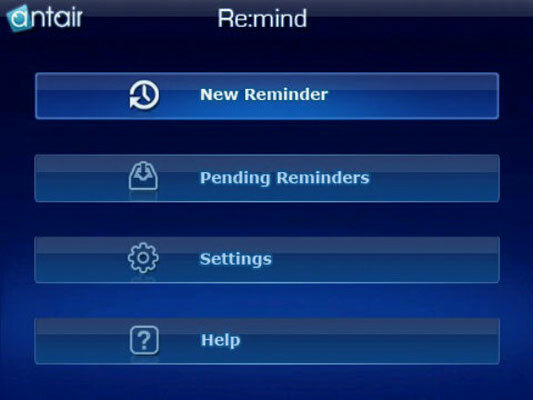 You can reply to e-mail and return phone calls directly from the reminder without having to look up addresses or phone numbers. E-Mail follow-up reminders include full contact information and a summary of the original message. Phone call follow-ups include a call-back number and any available caller-ID information. 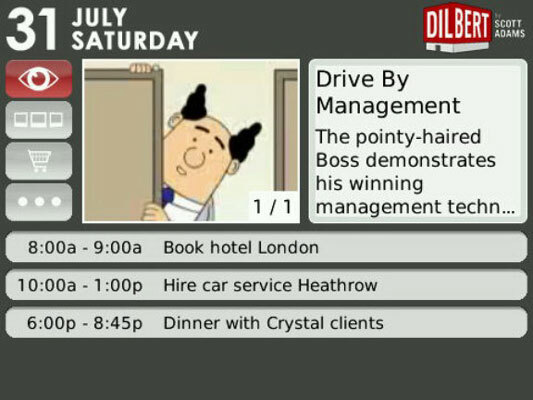 The Dilbert Calendar delivers a daily animated Dilbert cartoon to your BlackBerry, integrated to your device’s built-in calendar. So you can both amuse yourself and become depressed while you survey your day of disorganized meetings, pointless conference calls, and doomed-before-they-start product launches. You can get the Dilbert Calendar in a free trial to see whether you want to sign up for a subscription (which range from by the month to half-year to year). 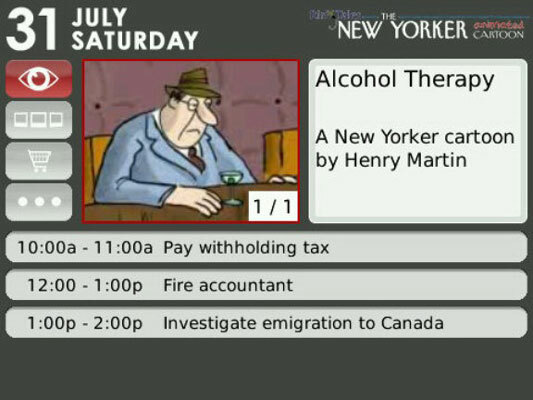 The New Yorker Calendar, distributed by the same company as its Dilbert cousin, works the same way: one cartoon or short video each day, along with a connection to your BlackBerry’s calendar for appointments. The calendar is offered free, but the subscription is valid for only a few days. You can pay for a subscription by the month, half-year, or year. LaterDude Pro, from MobileUtil, is a quick and easy way to remind yourself to get something done: Reply to an e-mail, phone someone whose call you missed, answer an SMS text, or be somewhere and do something at a specific time. After downloaded and installed, the app insinuates itself into the BlackBerry operating system and appears in most menus. The automated entries can be edited and refined from the keyboard of your phone. After the entry is to your satisfaction, click Save to add the event to the calendar. SBSH Calendar Pro is an extension or an enhancement to the BlackBerry’s built-in calendar database. It also synchronizes your BlackBerry to any calendar software you maintain on your personal computer with your phone. It’s all automatic, too. The calendar integrates appointments, tasks, and to-do lists. You can make any item private or public. You can categorize your schedule in the way that works best for you. All the items you enter in Calendar Pro are searchable within the app: appointments, meetings, and tasks. SBSH Historia is a highly specialized call-logging app. 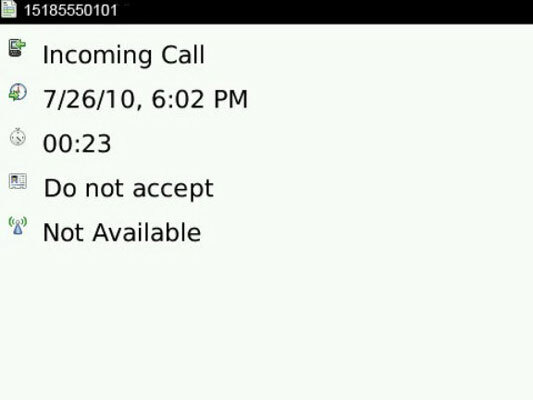 When you give it permission, it idles quietly in the background waiting for you to make or receive a call by using your BlackBerry. When the moment arrives, it springs into action and makes a record of as much detail as is available: incoming or outgoing, the number dialed or that called you, the caller ID or the contact information from your address book, and the date and time the call began and ended. You can also open up your calendar and add notes about the subject of the conversation, enter any follow-up tasks, and even send a copy of the calendar notation by e-mail or SMS to yourself, to the person you spoke with, or to another address. My List gives you a list of your lists of things that need to be done, and it also gives you a way to track items that are completed and those that are yet to be done. My List comes with a set of predefined categories, including Daily and Weekend, Shopping, House Ideas, Books, Music, and various celebrations. You can create others of your own. Within each category, you then create items. After you accomplish a particular task or purchase an item, you can check it off on your list but leave the category still in place. Or you can delete the item or the category after a complete list has been fulfilled.